Magic and wonder hide in unexpected places - a leftover piece of ginger, a wrinkled potato left too long in its bag, a humdrum kitchen spice rack. In Don't Throw It, Grow It! Deborah Peterson reveals the hidden possibilities in everyday foods. Peterson, former president of the American Pit Gardening Society, shows how common kitchen staples - pits, nuts, beans, seeds, and tubers - can be coaxed into lush, vibrant houseplants that are as attractive as they are fascinating. With Peterson's help, a sweet potato turns into a blooming vine; chickpeas transform into cheery hanging baskets; the humble beet becomes a dramatic centerpiece; and gingerroot grows into a 3-foot, bamboo-like stalk. In some cases the transformation happens overnight! Don't Throw It, Grow It! offers growing instructions for 68 plants in four broad categories - vegetables; fruits and nuts; herbs and spices; and more exotic plants from ethnic markets. The book is enhanced with beautiful illustrations, and its at-a-glance format makes it a quick and easy reference. 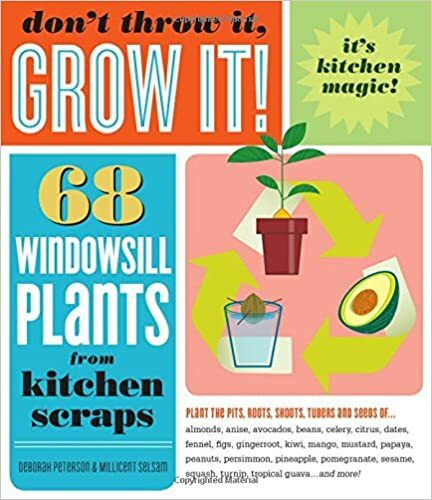 Best of all, every featured plant can be grown in a kitchen, making this handy guide a must-have for avid gardeners and apartment-dwellers alike. "Deborah Peterson…stops at nothing to grab some strange piece of produce, seed or pit to start a plant….Lots of fun here with figs, feijoa, fruiting citrus and more for the whole family." "I found Don't Throw It, Grow It! to be an absolutely delightful little book. I can't wait to start using as many of the suggestions as I possibly can. There were even ethnic fruits and vegetables I had never heard of - genip, anyone? Children will enjoy the magic of watching a new plant grow. This will help you brighten your living space while recycling at the same time. This is one of my favorite new books, and I just can't highly recommend it enough." "This clever little book from Storey -- priced right at 11 bucks in paperback --offers up suggestions for sprouting not just avocados, but also carrot tops, garbanzo beans, peanuts, jicama, lemongrass, ginger, and just about any other kind of grocery store produce… There's something so thrifty and retro about sprouting food from kitchen scraps that makes it seem just right for the times." "Here's another way to be creative with plants: Read Don’t Throw It, Grow It! Peterson and Selsam go way beyond the avocados and potatoes we used to root in water glasses. Besides fruits and vegetables, they include nuts, herbs, spices, and more international foods like chayote and litchi." Return to the Category "Reading Material"